intro For the moment, see the techtab of this page for the developing information on this species. cap The cap is convex with a central umbo and zonate with a dark (over center), then light, then dark (over striations) pattern. The color over the center is dark brown. The light band is a sordid pale tan. The color over the striation area is a lighter version of the color over the center. The cap's margin in long-striate. 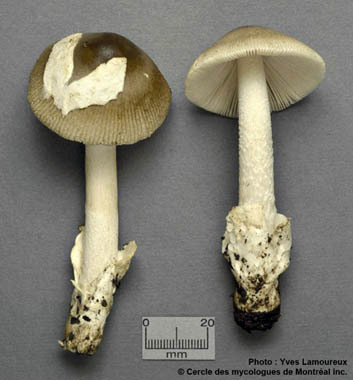 A white patch of membranous volva may be left on the cap. author double click in markup mode to edit. Unless otherwise indicated, the text below is derived from the description by Yves Lamoureux in his flicker account here: https://www.flickr.com/photos/27441280@N06/18900114684/. pileus 40 - 90 mm wide, dark brown over disc, medium grayish brown in zone over marginal striations, with intermediate zone sordid grayish tan; at first ovoid, then rounded-conic, then planoconvex and umbonate; margin long striate (0.4-0.5R); context white, ?? ; universal veil usually absent, infrequently present as large calyptra, membranous, generally white at first, grayish in part. lamellae ??, ? ?, whitish to pale grayish, grayish in exsiccata; lamellulae ??. stipe 70 - 120 × 5 - 12 mm, white or pale grayish, finely floculent at first, then smooth; context white, ?? : exannulate; universal veil as saccate volva, white, sometimes grayish in part, membranous, persistent. ecology Under Quercus, Fagus, and Betula. Occasional, July to September. material examined CANADA: QUÉBEC—?? Co. - ? ?, ?? Y. Lamoureux 1645 (CMMF). ?? Co. - ? ?, Y. Lamoureux 1633 (CMMF). discussion Some comments of YL: In Québec, with the present species, there sometimes also occurs another amanita that is smaller with a pale ash- gray to silver-gray pileus that is uniformly colored. Unfortunately, we haven't had the opportunity to collect the latter. 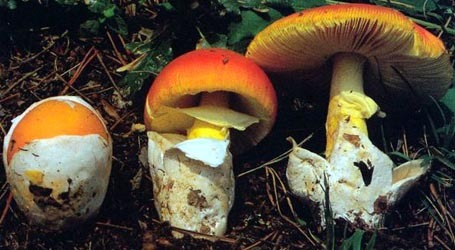 In North America, both of these taxa have been mistakenly identified as A. vaginata. Translation to English and reformatting for this site is by R. E. Tulloss who is responsible for all errors.